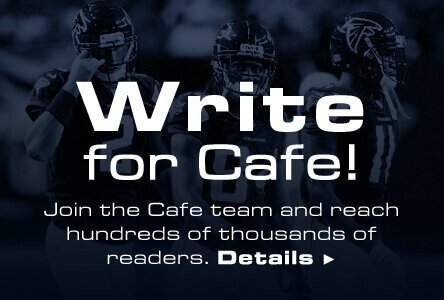 DailyFantasyCafe.com ("DFC", "we", "us" and "our") provides it's "Premium Service" (as defined herein) to you (also "User"), subject to the following Billing Terms of Service ("BILLINGTOS"), which may be updated by us from time to time at our sole discretion without notice to you. Please read the BILLINGTOS completely before purchasing a Premium Service (Premium Content, Advanced Tools or Professional), using our web site and internet forums. We recommend that you refer to the BILLINGTOS from time to time to help make sure you are aware of changes to this BILLINGTOS. This terms and conditions of use agreement ("Agreement") applies to the websites and services (as defined below) which are owned and operated by Daily Fantasy Cafe Inc By accessing this Website you are agreeing to the terms and conditions that appear below. If you have any comments or questions please contact us at Daily Fantasy Cafe Inc, 5319 University Dr. #175, Irvine, CA 92612. This Website and services are provided by Daily Fantasy Cafe Inc below ("Provider", also referred to as "we", "us" and "our") whose registered office is at 5319 University Dr. #175, Irvine, CA 92612. The Premium Services offered by Provider through the Website include any paid features, content, or applications offered or made available from time to time by Provider and/or its licensors in connection with the Website (collectively, the "Premium Services"). The Premium Services may be hosted inside or outside of the United States." Website Member" means a private individual who either: a) has subscribed to or registered with the Website; or b) is expressly entitled to access the Website and the Services by virtue of subscription to another product or service provided by Daily Fantasy Cafe Inc in accordance with the terms and conditions thereof. "User" means a Visitor or a Website Member. "Visitor" means anyone using the Website who is not a Website Member. "Websites" means the websites (including their constituent pages) with their home pages as set out below:www.dailyfantasycafe.com; and any other websites or electronic media sites or services from time to time (whether designed for access by mobile or fixed devices or otherwise), owned or operated by Daily Fantasy Cafe Inc as may link to these Terms and Conditions from time to time (and "Website" means any one of them). This Agreement sets forth the legally binding terms for your use of the Premium Services. By using the Premium Services, and in consideration of Provider providing the Services to you, you agree to be bound by this Agreement, whether you are a Visitor or a Website Premium Member. Only Website Premium Members are entitled to access areas of the Website restricted to Website Premium Member only access except and to the extent that Provider otherwise expressly consents in writing. You are only authorized to use the Premium Services (regardless of whether your access or use is intended) if you agree to abide by all applicable laws and to this Agreement. Please read this Agreement carefully and save it. If you do not agree with it, you should leave the Website and discontinue use of the Premium Services immediately. If you wish to register to become a Website Premium Member, and make use of the Premium Services available only to Website Premium Members, you must read this Agreement and indicate your acceptance during the registration and purchase process. Availability of the Website will commence on a date determined by Provider. Provider may modify this Agreement from time to time and such modification shall be effective upon posting by Provider on the Website. The BILLINGTOS can be viewed at any time at https://www.dailyfantasycafe.com/billingterms/. You agree to be bound by any changes to this Agreement when you access the Website or use the Premium Services after any such modification is posted. If you do not agree to be bound by them, you should not use the Website or the Premium Services. You agree that if you don't cancel within the 7 day free trial period, your subscription starts and you will be billed. The 7 day free trial starts on the date and time the Submit button is clicked and Payment is processed. You understand that full nor partial refunds will be provided. You can cancel at anytime. Login to your account. Click on My Dashboard in top right corner. Click on Billing Tab. Click the Cancel Subscription button and confirm. You will receive a cancellation email and your credit card will be not be charged on the next billing date. Refunds of any kind are not provided unles there is a mistake in you being charged in accordance with the BILLINGTOS. Provider is not responsible for any incorrect or inaccurate content posted on the Services or the Website or in connection with the Website or the Services, whether caused by Users of the Website or the Services or by any of the equipment or programming associated with or utilized in the Website or the Services. Profiles created and posted by Website Members on the Website or the Services may contain links to other websites although we are not responsible for any User generated links or linked-to content. Provider is not responsible for the content, accuracy or opinions expressed on such websites, and such websites are in no way investigated, monitored or checked for accuracy or completeness by Provider. Inclusion of any linked website on the Website and the Services does not imply approval or endorsement of the linked website by Provider. When you access these third-party sites, you do so at your own risk. Provider takes no responsibility for third party advertisements which are posted on the Website or through the Services, nor does it take any responsibility for the goods or services provided by its advertisers. Provider is not responsible for the conduct, whether online or offline, of any User of the Website or the Services. Provider assumes no responsibility for any error, omission, interruption, deletion, corruption, defect, delay in operation or transmission, communications line failure, theft or destruction or unauthorized access to, or alteration of, any User communication or any content provided through the Website. Provider is not responsible for any problems or technical malfunction of any telephone network or lines, electronic networks, computer online systems, servers or providers, computer equipment, software, failure of any email or players due to technical problems or traffic congestion on the Internet or on any of the Services or combination thereof, including any injury or damage to Users or to any person's computer related to or resulting from participation or downloading materials in connection with the Website or the Services. Under no circumstances shall Provider be responsible for any loss or damage resulting from use of the Website or the Services, attendance at an event organized through the Website or the Services, from any content posted on or through the Website or the Services, or from the conduct of any Users of the Website or the Services, whether online or offline. The Services are provided "AS-IS" and as available and Provider makes no representations or warranties of any kind as to the Website, the Services or the content thereof, including without limitation, as to availability of the Website and/ or Services for access and use. In particular Provider expressly disclaims all warranties of fitness for a particular purpose, accuracy, completeness or non-infringement. Provider cannot guarantee and does not promise any specific results from use of the Website and the Services. Nothing in this Agreement shall be construed as limiting or excluding Provider's liability for death or personal injury caused by its negligence. 10. Choice of law and Jurisdiction. This Agreement shall be governed by and interpreted in accordance with English law and you irrevocably agree that the courts of England and Wales shall (subject to the paragraph below) have exclusive jurisdiction to settle any dispute which may arise out of, under, or in connection with the Agreement. Nothing in this clause limits the right of Provider to bring proceedings against you arising out of or in connection with the Agreement (a) in any other court of competent jurisdiction or (b) concurrently in more than one court of competent jurisdiction. You agree to indemnify and hold Provider, its subsidiaries, and affiliates, and their respective officers, agents, partners and employees, harmless from any loss, liability, demand, claim or legal proceedings brought or threatened, including expenses of any character suffered or incurred arising out of your use of the Website or the Services in violation of this Agreement, and/or arising from your use of or conduct on the Website or in use of the Services and/or a breach of this Agreement. 13.2 If we give you notice that we will increase the price of your subscription and you do not wish to continue with your subscription you should let us know within four weeks and we will cancel your subscription. 13.3 You have the right to cancel your subscription or registration. 13.4 To cancel your subscription you must Login to your account. Click on My Dashboard in top right corner. Click on Billing Tab. Click the Cancel Subscription button and confirm. You will receive a cancellation email and your credit card will be not be charged on the next billing date. 13.5 Your subscription or registration will commence at the time and date on which your registration or subscription processing is complete and will continue unless we terminate it or you cancel it in accordance with this clause. 13.6 As this is a shared service with other Users, you agree that if the demand for the Services provided by the Website is in excess of our ability to meet the capacity, we may either share the capacity among all Users or we may give you notice by e-mail that the provision of the Website will terminate. Any such termination will not affect your accrued liabilities incurred prior to any such termination. 13.7 We may change, suspend or discontinue any aspect of the Website and/or Services at any time including the availability of any feature of or other content in the Website. 13.8 We reserve the right to offer the Website and/or Services only to residents of certain territories. We may terminate registrations of anyone who is not a resident of those territories. 13.9 Where you have purchased your subscription to the Website through a third party commencement and cancellation provisions may apply as may be notified to you by that third party at the time of purchase. Your dealings with any third party and any terms, conditions, warranties or representations with such third parties are solely between you and such third party. You agree that we are not liable for such dealings, and you agree to indemnify us in the manner referred to above in the Agreement in relation to such dealings. 14. General Site Terms and Conditions. This agreement operates alongside the general terms and conditions for site use as can be found from the link on the bottom of the DFC website and these pre-existing terms are also applicable. In the event of dispute between the terms, the pre-existing terms and conditions take precedent.